When we were getting ready to head to Disney World last spring, we allowed NHL to earn money doing certain things. The purpose of this was for NHL (5 at the time) to have the ability to make some of his own purchases. Not only would he be able to keep track of his earnings, but he would also see the value of his money as he spent it on items he liked at stores on vacation. This experiment went pretty well. NHL actually bought one item and came home with a lot of leftover money. NHL has learned over the years that we put away money that he gets from his birthday into his savings account. We have explained to him the importance of having this money or when he goes to college in the future. Other money has also been invested on his behalf for college. Without realizing it, we had talked with him in elementary terminology about saving, spending, and investing money. When Hebrew School started in the fall, they began to talk a lot about Tzedakah. The kids would bring money for the Tzedakah box that would be sent to Israel and other charities. Over the last week, we have slowly started to talk to NHL about Haiti. We have mentioned to him that it is important for all people to help others and usually this means donating money to help them. TechyDad and I explained that in Haiti they will need to rebuild everything, get medical care to the people and send the survivors food and water. In his own way, NHL understood. We talked about going to the local grocery store and donating money to the charity for Haiti. To assist us even more in making NHL a money savvy individual, we were lucky enough to be sent a Money Savvy Pig to review and use with him. One slot piggy banks have been around for….centuries. But the world has changed. Now we have a highly sophisticated financial system, a system whose complexity has outstripped the ability of most adults, many of whom grapple with credit card debt, even bankruptcy. Personal finance education needs to start young. How? With the same universally loved childhood toy, the piggy bank….but with a 21st century twist! 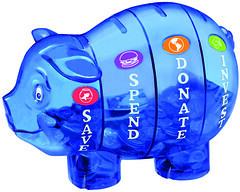 The Money Savvy Pig piggy bank has four chambers, one for each of the four money management choices a child should be taught from the time they are small. They are SAVE, SPEND, DONATE, and INVEST. When NHL was asked to pick out a pig color for our review, he immediately selected green. When I asked him why he quickly replied "Money is green!" Good reply from a six year old child. So far we have really worked on talking with him about the save, spend and most recently the donate areas of his pig. The invest portion is still a little too abstract for a first grader. We are working on ways for NHL to earn money to put into his Money Savvy Pig and where to place the coins when he receives them. As a parent, I really appreciate the attention to detail that Susan Beacham (founder of Money Savvy Generation) has put into this product. I had seen it on several television shows and mentioned in magazine articles after it won awards and was curious about trying it with NHL. I can see how the Money Savvy Pig will continue to grow with him as he becomes a more mature consumer. As an educator, I love how this could also be used in a classroom. With older children, it could be a fabulous lesson and classroom party goal project. I know that we will continue to use the Money Savvy Pig with NHL and eventually with JSL to help them to become money savvy adults. In this day and age, it is even more important as our society digs the way out of the economic struggles. Disclosure: I received the Money Savvy Pig complimentary of Money Savvy Generation in order to facilitate this review. No other compensations was given. The opinions expressed in the review are my own feelings about the product that my family tried. I wonder if their terms are out of date, too… Also, what would the difference between “invest” and “save” be for a child? Hmm. Looks like a cool product, though! .-= RobMonroe´s last blog ..Awkward Moment: Mall Edition! =-.